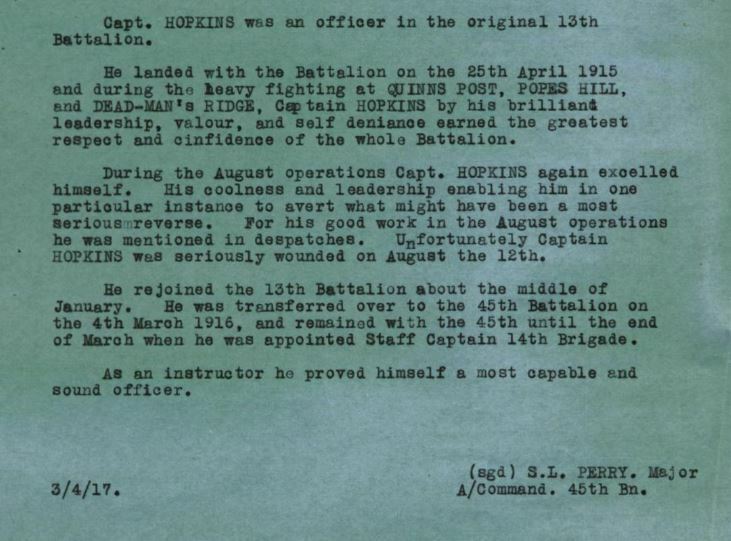 Clive Hopkins was born in 1896 at Mordialloc to Charles William Hopkins and Julia Mahoney. Clive was a very bright student attending Warracknabeal College where at the age of twelve, his teacher recognised his academic abilities. 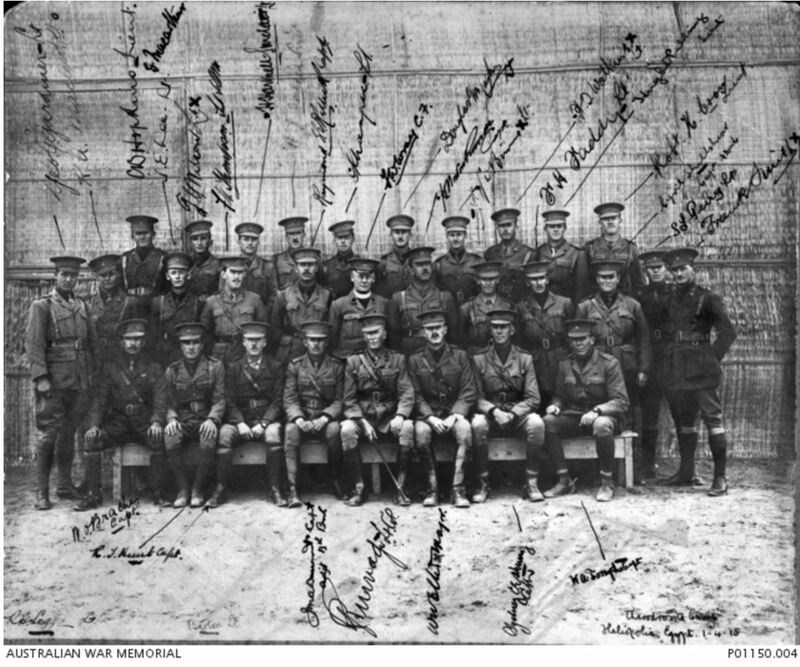 Clive then went to the Warrnambool Agriculture High School and was a sergeant in the school’s cadet forces. With a military background on both sides of his family, Clive applied to attend Duntroon, receiving the highest score of any Victorian in the entrance exam. With the outbreak of war, eighteen-year-old Clive was one of very few chosen from Duntroon to serve overseas without already finishing training. He was given the rank of Lieutenant and left for Egypt on 22 December 1914. 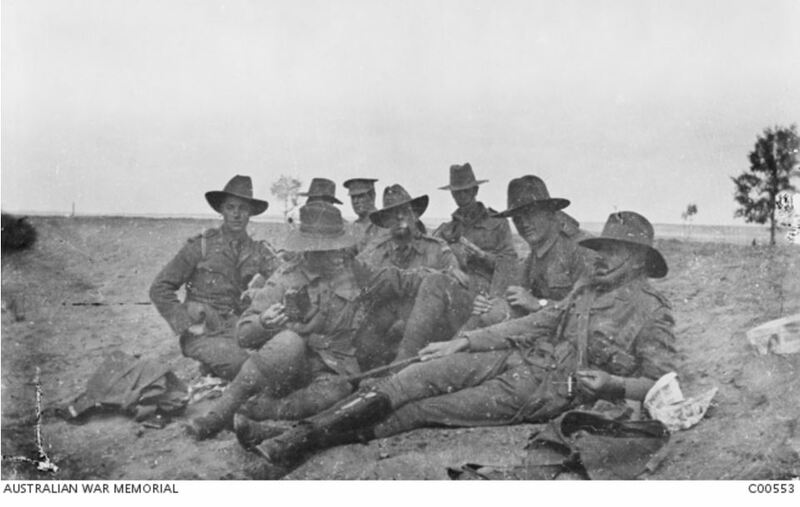 April 1915 arrived and Clive was off to Gallipoli where he was in charge of a 13th Battalion’s machine gun section. He was promoted to Captain due to gallantry displayed while leading his men and was one of the youngest men on active service to reach that rank at just nineteen. While at Gallipoli, Clive was wounded when a bullet hit his revolver and transported from Gallipoli back to Egypt. After his discharge from hospital he fell ill and it was found he was suffering Typhoid fever. After his second stint in hospital, Clive joined the 45th Battalion. Around June 1916, Clive left for France as a Staff Captain with the 14th Brigade. Based at headquarters, Clive was seeking a more active role and was transferred to the 14th Light Trench Mortar Battery. As a result, he was there at the front line at the Battle of Fromelles on 19 July 1916. At around 5.50 am on 20 July 1916, Clive was killed. While Clive was overseas, Charles Hopkins, station master at the St Arnaud railway station, was given the role of station master at Hamilton. The Hopkins family moved to the town, living in Brown Street close to the station. When word came through in mid-August 1916 of Clive’s death, Hamilton’s Archdeacon Harris delivered the sad news to the Hopkins family. As well as a tree planted for Clive along Hamilton’s Anzac Avenue he is also remembered with a tree along the Bacchus Marsh Avenue of Honour and the Woodend Avenue of Honour, the ACT Memorial, the Warrnambool War Memorial and with a stained glass window at the Bacchus Marsh Holy Trinity Church.